What you wear to a wedding depends on the type of event, whether it's casual or formal, indoor or outdoor, etc. I usually opt for a dress with a feminine silhouette that I will be able to use on other occasions. I can't stand having clothes on my closet that I never use. The shoes depend on the location, for instance I've worn this dress with two different shoes: this rhinestone strappy sandals and also wedges for a wedding that took place on grass so that my heels wouldn't get stuck on every step. This Claudie Pierlot dress is perfect to wear as a wedding attire; the color, fabric, spaghetti straps and scalloped bust make it sweet and feminine. It's lightweight and comfortable for dancing which are something you must consider before buying a dress for a summer wedding. I kept jewelry to a minimal with my pearl earrings and this bracelet and this necklace by Spanish jewelry brand Tous. The clutch is a favorite of mine that I got last year. I like it so much I try to buy dresses that will match it so I can wear it to all sorts of formal events, I can't get enough of it! You can also see how I styled it with this white lace dress. In case you are still looking for a wedding guest dress or you want to take advantage of the sales to stock up for next year I'm sharing my favorite midi dresses and strappy heels below. They are all similar styles but there's a wide range of prices. P.S. I did my hair using my new Irresitible Me Diamond hair styler. Have you read the review yet? Find it here. Love that color on you and that clutch is gorgeous! You look amazing, that dress is perfect for a wedding guest attire. With this wonderful dress you are not only perfectly dressed for a wedding! you look so pretty! I love the scallop neckline on this dress! That's such a great color and cut on you!! I'm having a black tie/ formal wedding and I can't help but wonder what people will wear.. It's such a great dress for a wedding! 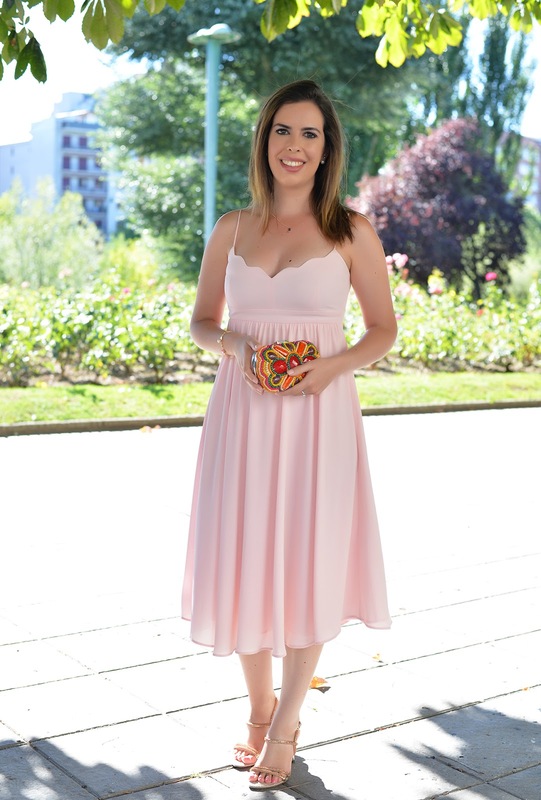 I've been invited to a few of weddings this season too and I'll definitely keep that style in mind while shopping for my wedding guest dresses! By the way, you look stunning! This is an adorable outfit! I love the bag you paired with it also! this is a perfect dress for a wedding. Simple and stunning silhouette. What a pretty look, I love the scallop edges! This dress is the prettiest. I love the color and the scalloped detail around the neckline. Such a pretty blush color on you, lady! What a gorgeous dress! it is so perfect for a wedding--I love the scallop detail and the soft blush color. I love the scalloped neck line and shape! I totally could see this working with heels or flats like you said. I'm in love with this dress! Wonderful and delicate outfit! Nice photo! Most likely you'll find a buyer that posted an overview online about that piece you want to buy so badly. at the teeth or may use a tooth pick, but nevertheless these can't attacks the positioning where some in the worst bacteria hide. tooth that may reap the benefits of some kind of treatment. immediately caught the flamboyant of patients and doctors alike for that ease and convenience it provided. every other Saturday for emergencies. If a root canal is not done or even the tooth is not pulled it is possible to end up having an abscess or further infection. , you ought to also ask your dentist about how exactly frequently you need to be using an exam to make sure healthy teeth and gums. to be used with the aligners.